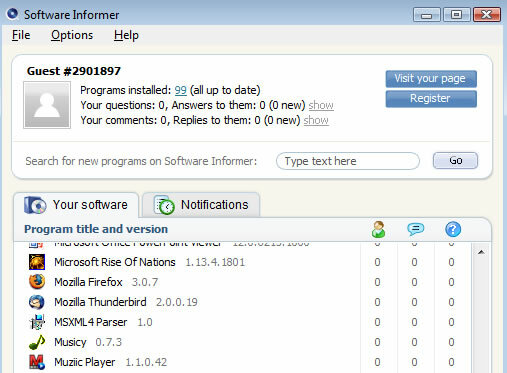 If you are looking for a better solution to upgrade to latest versions of the software installed on your system, then check out Software Informer. This program checks the installed programs and informs you if there are any updates available for those software. Software Informer connects to its website to check if there are any updates avaialbe for software you are using. If there is an update available you can easily update to the latest version. Software Informer has built-in social features like user comments and questions. You can see other user comments or questions regarding the software in question. Not only software updates but you could also receive other comments and questions. Clicking on the program name will give you a quick look of the comments, program site and rating for the software. The menu will allow you to control the notifications you want to receive. Also see SUMo, similar application to keeo installed software upto date. Love the social aspect of the software. Currently are using SuMO and FileHippo Software Checker the achive my software update objectives.